Eating healthy and reducing food waste go hand in hand. I have always eaten healthy 80% of the time but never really felt like I was setting myself up to eat healthy more than that. My food life was disorganized and as a result I was constantly throwing spoiled food into the composter when I would clean my fridge out to make room for new groceries. Last month I undertook a food and lifestyle overhaul and as a result I feel like I have organized the food in my life. What I didn't expect to happen was such a dramatic decrease in the amount of compost I was producing. I just do not produce nearly as much food waste because I am eating the food before it spoils. If you eat packaged or processed foods, the change to fresh foods will also help you reduce the amount of garbage and recycling that you have. Here are the 5 easiest ways to ensure you chose healthy food and that will also reduce the amount of food waste your are producing. There is this myth out there that washing your produce will make it spoil faster. Honestly, it just isn't true. Washing it as soon as you get it home is not going to decrease its freshness. 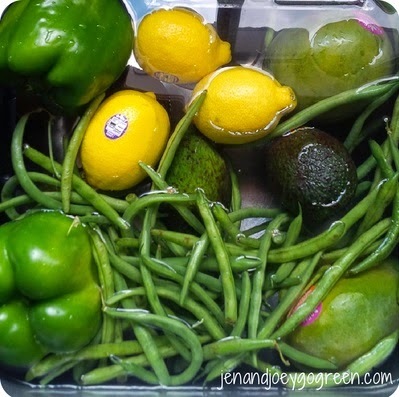 Place produce in the sink as soon as you get it home. Add 1 cup of organic white vinegar and fill the sink with cold water. After you have everything washed you can cut up fruit and vegetables for snacks and salads throughout the week. I have significantly increased the amount of greens I am eating and decreased the amount of old slimy lettuce that I am composting just by washing lettuce and kale and keeping it wrapped in cloth. When I am making eggs I reach in and grab some kale to add to the pan, when I am looking for a side dish I grab the romaine and quickly make a salad. 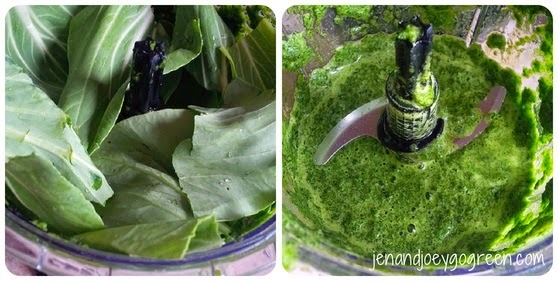 Greens stay fresh for well over a week using this storage method but if you somehow don't use them all up in time you can easily blend them up to add to smoothies. Think beyond kale and spinach and use up old bok choy or collard greens by blending and freezing for addition to smoothies. Once blended with a bit of water, fill up some ice cube trays and plop them in the freezer. When they are frozen place take them out of the trays and put them into a reusable bag. Note - if you are going to freeze kale make sure you sautee it a bit first before adding it to the blender. Welcome to our fridge. 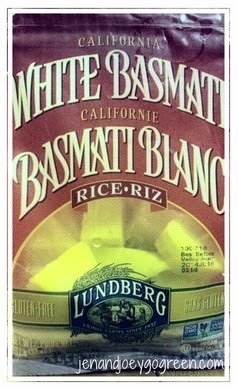 It recently got a completely rearranged to ensure that the healthiest foods are readily available. 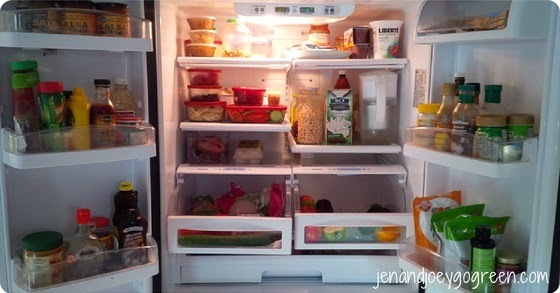 Organize your fridge to keep those foods that you eat the most often up front. Have a spot for everything and you will ensure that you rarely are throwing spoiled food into the composter. By changing how our fridge is organized I have cut how much we are having to compost in half. Check your nuts, oils and seeds. You may be surprised at what needs to be stored in the fridge. Store food in glass containers so you an see exactly what you have and use it up before it goes bad. Soak and pre-cook brown rice, quinoa and beans so you can add them to salads, wraps or soups. Cut up vegetables and fruit for the week and keep them stored up front in a glass container. 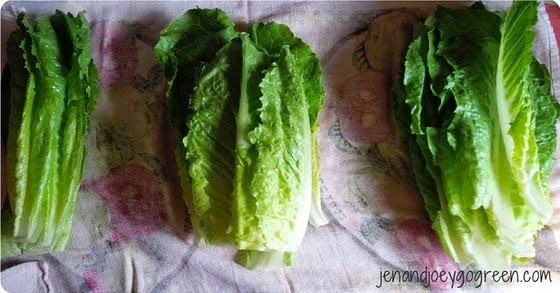 You are more likely to eat them if they are already cut and you can see them front and center. I separate healthy vs unhealthy condiments so that I can see the healthy making the unhealthy ones a secondary thought. If I am not using something up fast enough then I transfer it to another container and throw it in the freezer. I don't know why ever smoothie recipe seems to produce enough to feed a family. 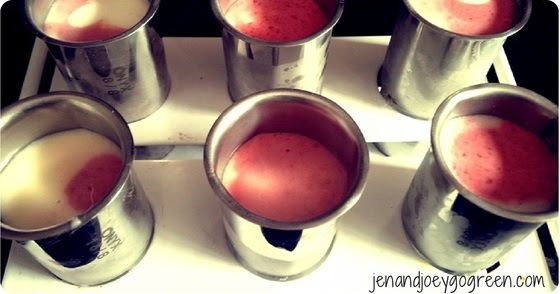 I used to just split it up into 2 for me and 1 for B, but now take some from every batch and add to my popsicle molds to make frozen smoothie treats. Sometimes I fill an entire mold with one kind of smoothie and other times I will save it in a glass jar in the fridge and then the next day do a 50/50 split in a mold of 2 different types of smoothies. For some reason I always forget when I have bought melon or pineapple. How is this possible when they are the largest of the fruits? Anyways, when I forget and don't feel like going into a melon/pineapple frenzy I simply cut them up and freeze them on a baking tray before adding them to a reusable bag. You can see that I like to reuse any kind of bag that is in our house and these rice bags are perfect for storing cut fruit or cubes of greens. 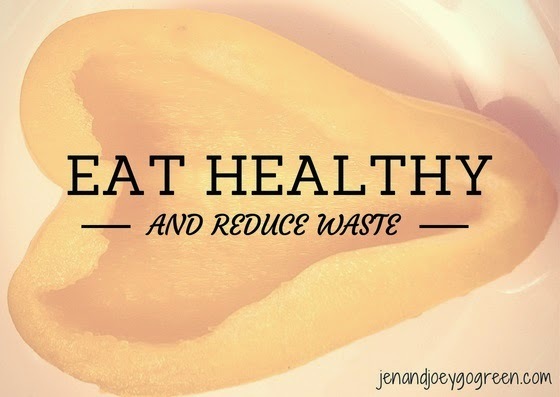 What are other easy ways to eat healthy and reduce waste? I love this post! One thing I often say is food that produces junk is probably junk. In other words, I saw a doritos bag in the woods and it was so jarring compared to the greenery. Not only was it junky for the body, but then trashed the planet. Thanks! Love the green smoothie cubes and smoothie popsicles! Thanks for linking up with WYWW!